In those early weeks your baby is up feeding every few hours and, if they’re like mine, pooping too. So you change several times overnight as needed. But once babe is sleeping longer (hallelujah) you’d rather not disturb them with a change overnight. Ordinary daytime cloth won’t last you, but there are a few different solutions that can go the distance! This article contains affiliate links. Thank you for supporting my blog by using these links when purchasing products at no extra cost to you. Here are a few things that I’ve learned about overnight cloth diapers. This “insert sandwich” that I made uses 2 of my favourite brands of inserts: AMP and Thirsties. You start with a 2 ply AMP insert (hemp preferred) and fold it in half. Inside you lay one large Thirsties hemp insert and one 3ply AMP hemp booster. It’s a pretty trim all night solution and fits inside many different brands of pockets. I prefer to use one-size Funky Fluff AWJ (athletic wicking jersey) pockets as they’re really stretchy and have lots of room for my big hands to stuff. This insert sandwich can also be used with AMP and Thirsties pockets, or laid inside a simple cover. If using a cover, consider a fleece liner for that stay-dry effect. There are many different recipes for insert sandwiches out there. Maman Loup has a great one to check out! Long touted as the ultimate overnight diaper, the Grovia ONE belongs on this list. I have been using this diaper, with both included inserts, for 60+ nights leak free. It surprised me, to be honest, because the fit is not ideal for us. Yet every morning the diaper is completely saturated from edge to edge in every direction, and the sheets are dry. 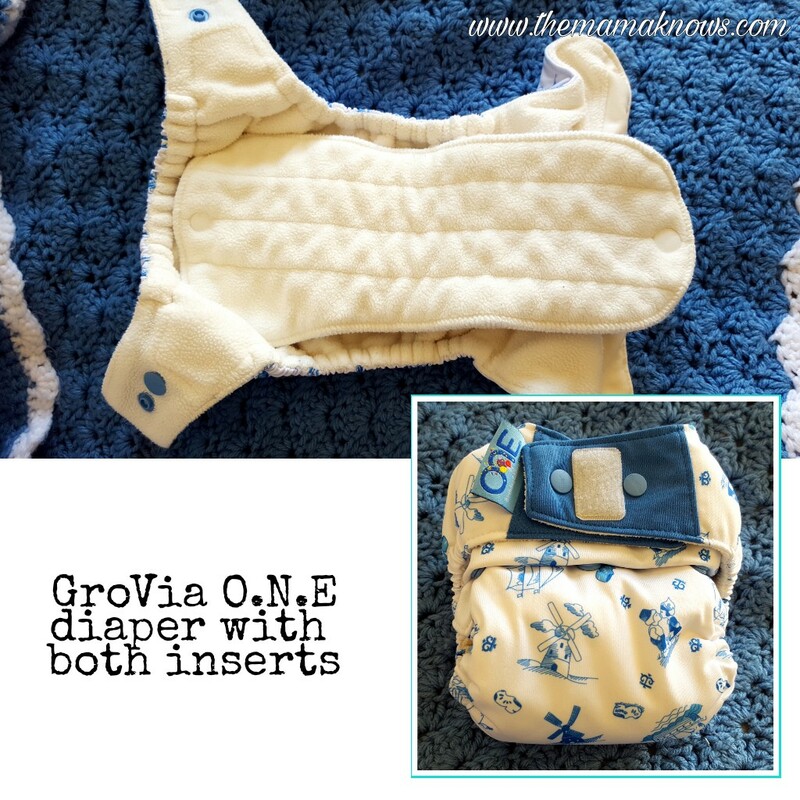 The GroVia ONE comes with both velcro and snaps, on one diaper. You can simply remove the velcro if it’s not your jam. They are lined with a soft, but bulky, microfleece and have both large and small snap in cotton inserts. While marketed for 10lbs and up, my 17lb 10 month old is still on the smallest rise. I cannot imagine these fitting us at all before 14lbs. As for adding boosters, I can squeeze in an AMP 2ply Hemp booster but nothing else. Despite the bulk and wonky fit, they somehow work for me! And if the reviews are to be believed, they work for a great number of babies. The price is right too, at around C$31. You can pick these up at any of my affiliate retailers including Calgary Cloth Diaper Depot. 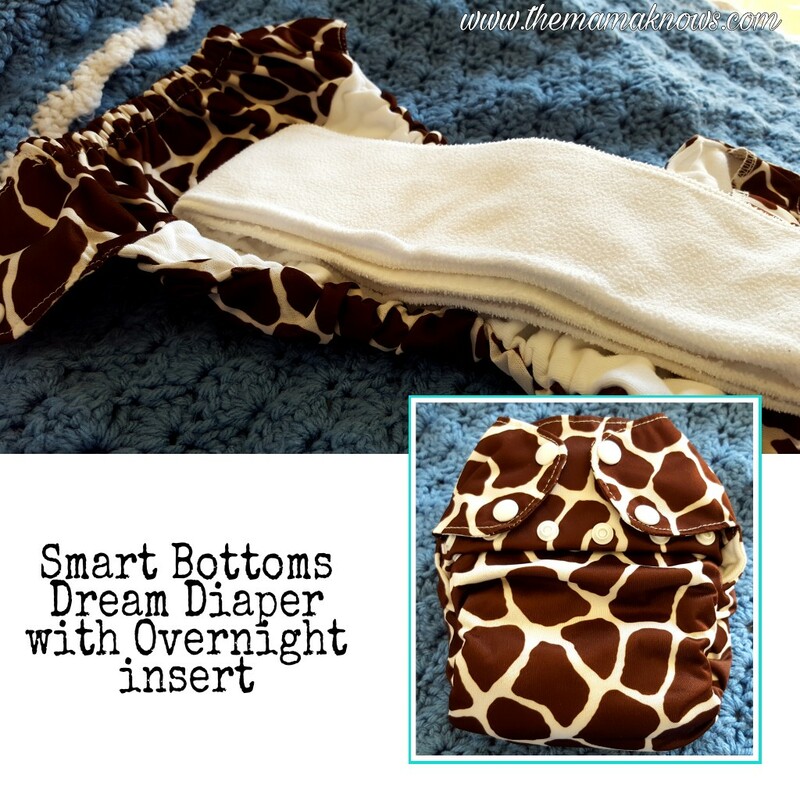 I was very excited to try the Smart Bottoms Dream Diaper with the snazzy Overnight Insert- and I love it! Just snap out your daytime insert and pop in the doubled absorbency overnight insert (with attached stay dry layer) and, voila! 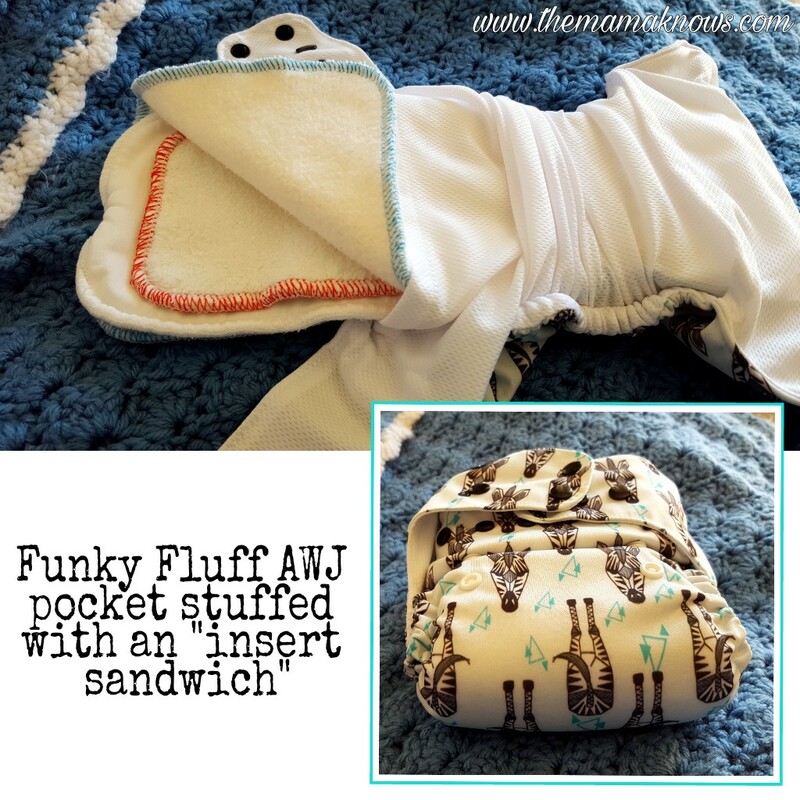 A simple and well-performing overnight cloth diaper! The diaper is made of a hemp/cotton blend, which you know is my favourite cloth diaper material. So absorebent- and so very trim! Even with all the extra layers of the overnight insert, this diaper isn’t overly bulky. The only downside is that the diaper is very narrow. Also, the overnight insert is sold separately, so you end up with a daytime insert just sitting around with no diaper. Not a big deal really, and because I was curious I tried adding it to my other dream diaper (so that’s two daytime inserts together) with a stay dry fleece liner on top and it totally worked for overnight. The Dream diaper 2.0 has just been released and I havent tried it yet but I’m expecting it to be even better! I used to use the Best Bottom microfiber overnight inserts on my second-born, and they were so bulky. They also werent absorbent enough. I never tried the hemp overnights with him and now I wish I did! I bought one from Cozybums to try with Littlest and it’s absolutely amazing. So trim! Plus, it’s good timing because we also just tried the new Bigger Best Bottom shell for the first time and it’s perfect for overnights. 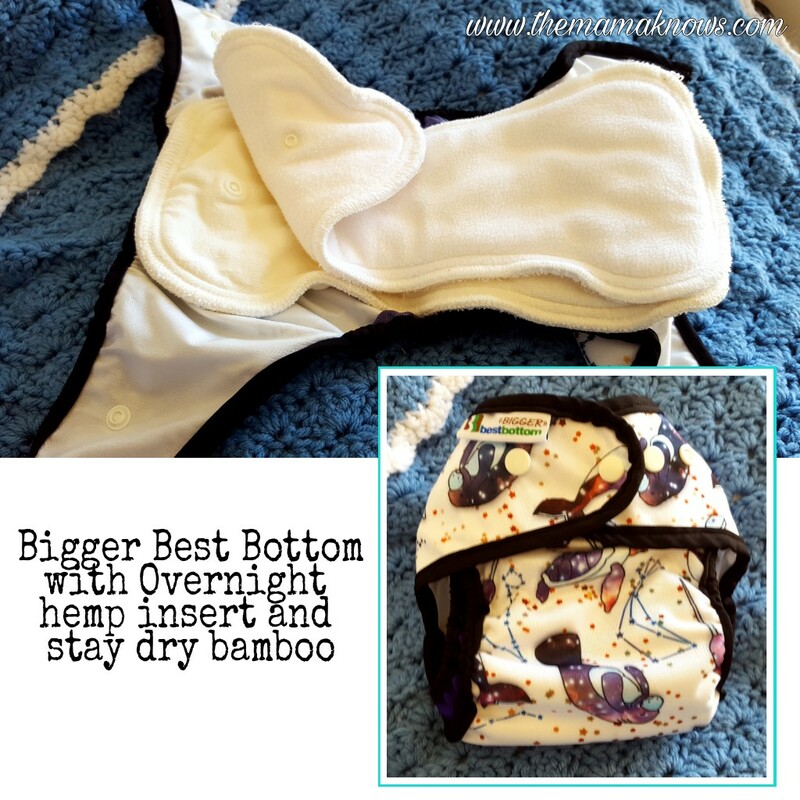 The new Best Bottom stay dry bamboo insert was the perfect choice to snap on top of the overnight hemp. The snap system is awesome and really makes these diapers easy to use. They’re my husband’s favourite brand for a reason. Altogether we have the Bigger Best Bottom cover, overnight hemp insert and stay dry bamboo insert- all sold seperately. This brand sells inserts in small, medium and large based on baby’s size and the shell is One Size. Although for the Bigger Best Bottom shell I would avoid Small inserts. All my affiliates sell most or all of these products. You can take your pick and shop from your favourite trusted retailer. 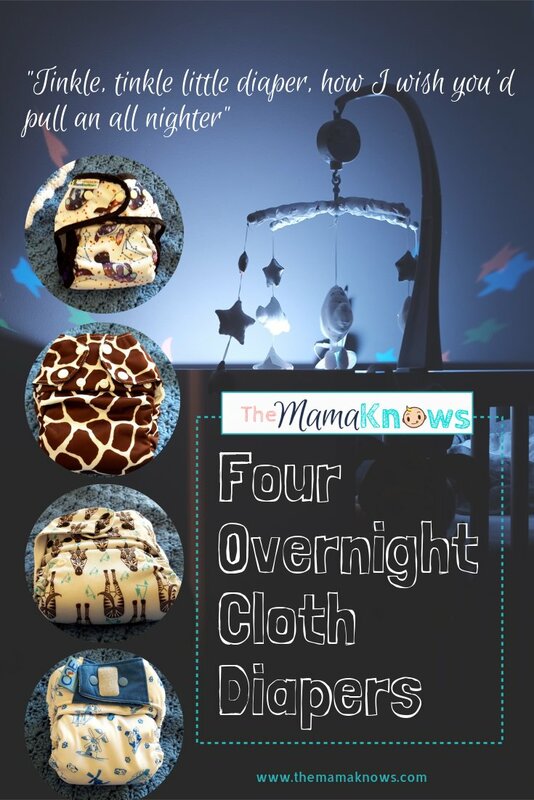 I just wanted to quickly mention my Thirsties Overnight Cloth Diaper which you can read about on this post https://www.themamaknows.com/thirsties-overnight-cloth-diaper/. its a fantastic overnight solution that perhaps even out-does all of the 4 mentioned here. Check it out! 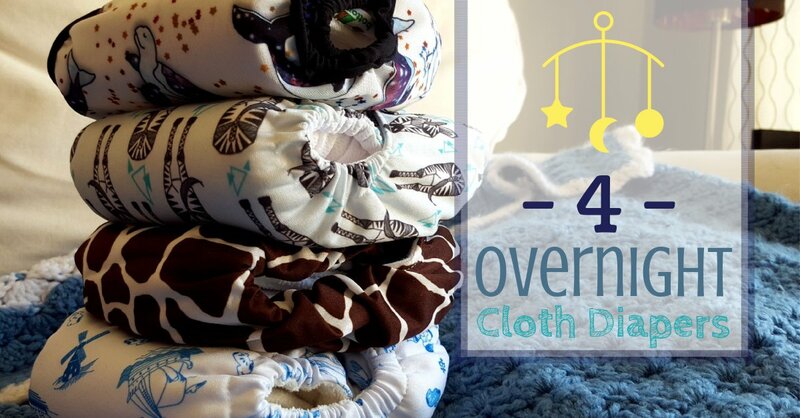 Do you use cloth diapers overnight? Has it been successful? Share your experiences in the comments below and let other moms know what works for you. Don’t forget to share this article on your favourite social media using the share links at the top of the post. Thank you for sharing this! We use Thirsties NAIO with 2 hemp organic cotton inserts. It would be nice to have an easier solution for my husband to do the nighttime diaper before bed. If it were already a ready a diaper with inserts int he pocket would go on easier than fitteds with inserts inside. We have used THX bamboo fleece OS fitteds under a cover for my 10 mo. old grandson overnight for 12-14 hours with no leaks. However, they are so saturated we are going to add a Thirsties Duo Hemp Sz. 2 behind the fitted this week. We also have1 Pooters overnight hemp fitted that comes with 2 snap in inserts & a fleece lined overnight insert. So far we haven’t needed to use the overnight insert because it works so well. After reading about the overnight sandwiches I want to try one with what we have: Geffen Hemp/Cotton Fleece Prefold & Super Absorber Plus insert under a Thirsties Cotton Doubler & a fleece/birdseye cotton liner I made. It would be 17 layers of hemp/cotton fleece & 5 more of cotton! They are such trim products I think they will all fit in a Blueberry Coverall or Thirsties sized cover. You’ve inspired me, I might just give this overnight cloth diapering thing another try. I use mostly pockets with flats in them (on top of the pocket), i hope that works, too. Thanks for sharing!! I’ve been lucky to not have heavy wetters but I have friends whose kids are and will tell them to try some of these diapers! I’m glad to read about overnight options as I haven’t attempted that yet! I just switched to cloth a month ago for my now 16m old son. I still use disposables at night, and I mostly use covers with MF inserts or FST during the day time. I wanted to keep costs low, but maybe I will try one of these options and see what works!